The pitch is a key part of Cathay's three-year turnaround strategy that demands a transformation of its marketing approach. Cathay-Pacific is conducting its first major agency pitch in 25 years after a request for information was sent to dozens of agencies last week. The comprehensive pitch is a key part of the airline's three-year turnaround strategy, announced last year, that demands a transformation of its marketing approach. The entire turnaround, centred on ultimately becoming "a brand-led organisation", is also targeting HK$4bn (£360m) in savings from operational restructuring. Cathay reported on 14 March its biggest net loss in nine years of HK$1.26bn. Not just a creative agency review, the pitch is tipped to involve a long list of agencies—not just networks but also independents—all around the world, as the brand casts a broad net to find the next set of marketing partners that will help it realise its 'Time To Win' change programme by 2019. The main agencies currently on the company's roster are McCann, MRM, ICLP, Eight Partnership, Superunion, and Edelman. Of the above, McCann's relationship with the brand has been the most lasting. The dedicated Cathay Pacific Central Team assigned to the account has drawn resources from the Interpublic Group and spans more than 30 markets. Since McCann Erickson Worldwide took over the Cathay account from Leo Burnett in 1993, the agency's work has not been formally reviewed. Recent work from McCann includes winning the Grand Kam Fan for 'The Altitude Brew (Betsy Beer)' campaign in 2017, and hosting the 'Marriage in the Air' campaign to promote the closer relationship between Cathay Pacific and the newly-rebranded Cathay Dragon in 2016. 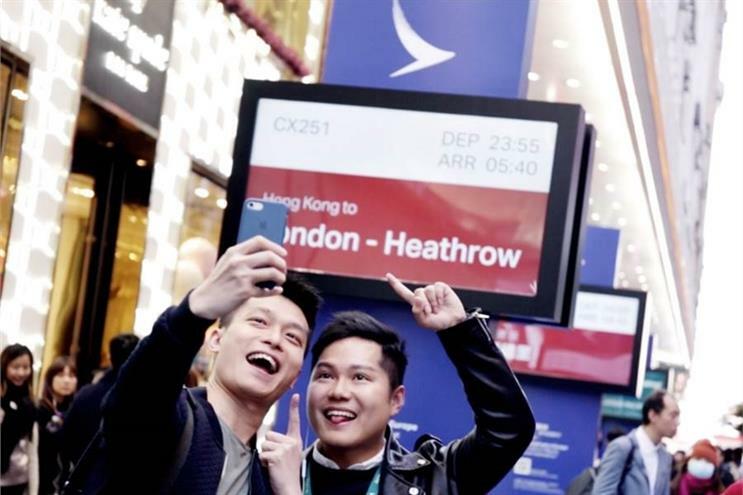 Most recently, the company set up check-in counters and gate signage on a busy street in Hong Kong and gave away flights to promote European routes. It is understood, from sources close to the pitch, that the marketing world has changed so much that Cathay Pacific deems it important to fully reassess its marketing processes, including the ways media might be bundled with creative, how to get control over utilisation of data and whether programmatic buying should be outsourced or done in-house. The airline already has in-house data-marketing and content-production teams. Edward Bell, general manager for brand, insights and marketing communications with Cathay Pacific, was unable to elaborate on specific details of the pitch, but in a video interview last week at Campaign360, said the brand "needs different kinds of agencies to do different things, as Cathay has a broader group of needs than in the past". These needs range from overall strategy to audience segmentation, value proposition development, digital storytelling and sales automation. "We need agencies to understand the ecosystem of how we work and plug in all these bits into the big machine," Bell said. While companies today can solve a lot of the problems they used to get their agencies to solve, and agencies don't know the clients' businesses as well as the client itself, what they can do is to bring fresh thinking and inspiration from other industries, he added. The pitch is expected to conclude in the third quarter of this year. Campaign has reached out to Brandon Cheung, managing partner of McCann Worldgroup’s Cathay Pacific Central Team, for comment.